Indian Navy Recruitment 2018 Online applications are invited from unmarried male candidates (who fulfill eligibility conditions as laid down by the Government of India) for enrollment as sailors for 2500 vacancies (Approximately) for Senior Secondary Recruit (SSR) – Aug 2019 batch. Those candidates who are interested & eligible candidates should check official notification & apply online.Indian Navy Recruitment 2018 ,Brief information has given below. Qualified in 10+2 examination with Maths & Physics and at least one of these subjects:- Chemistry/ Biology/ Computer Science from the Boards of School Education recognized by MHRD, Govt. of India. Candidates (except SC/ST candidates, who are exempted from payment of fee) are required to pay a fee of Rs. 205/- (Rupees Two hundred five only) through online mode by using net banking or by using Visa/ Master/ RuPay Credit/ Debit Card/ UPI. 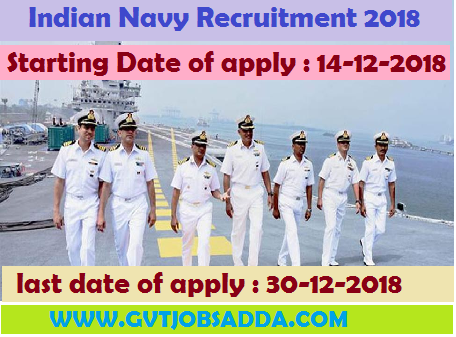 HOW TO APPLY :- For this entry, the candidates can apply ONLINE ONLY on the official website www.joinindiannavy.gov.in from 14 Dec 18 to 30 Dec 18. Other Post If You Interested In.